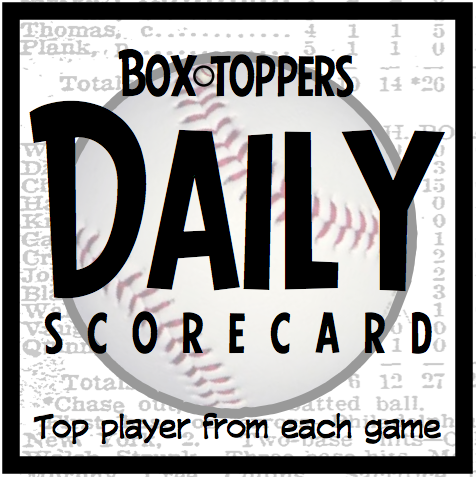 Giants pitcher Madison Bumgarner is Saturday's Player of the Day and rises to eighth place among players in Box-Toppers points for the season. Meanwhile, Rays pitcher Matt Moore, American League Player of the Day for Saturday, rises to third place in Box-Toppers points for the season. Bumgarner struck out nine over seven innings in the 4-2 win over the Dodgers. He earns 2.0 Box-Toppers points for being Player of the Day, giving him 10.7 for the season, moving him into eighth place in player standings (see the updated top 10 list on the home page). Jay Bruce of the Reds is National League Batter of the Day. Bruce went 2-for-4 and drove in three runs in the 13-4 win over the Mariners. Brian Dozier of the Twins is AL Batter of the Day. Dozier hit a three-run homer and drove in four runs in the 6-0 win over the Blue Jays. This was Dozier's Box-Toppers debut, the first time he has been named Player of the Game and he is the 3,219th player to debut since Box-Toppers record-keeping began in 1995. Bumgarner receives 2.0 Box-Toppers points for being Player of the Day. Moore receives 1.7 for AL Player of the Day. Bruce and Dozier each receive 1.5 for being top Batter of the Day in their league.